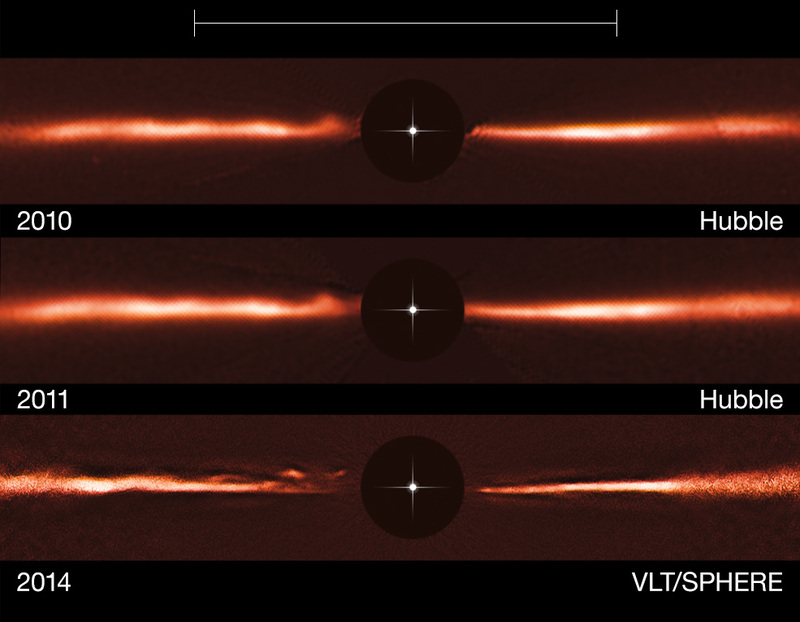 Using images from the NASA/ESA Hubble Space Telescope and ESO’s Very Large Telescope, astronomers have discovered fast-moving wave-like features in the dusty disc around the nearby star AU Microscopii. These odd structures are unlike anything ever observed, or even predicted, before now. The top row shows a Hubble image of the AU Mic disc from 2010, the middle row Hubble from 2011 and the bottom row is an image taken with the SPHERE instrument, mounted on the Very Large Telescope, from 2014. The black central circles show where the brilliant light of the central star has been blocked off to reveal the much fainter disc, and the position of the star is indicated schematically. The scale bar at the top of the picture indicates the diameter of the orbit of the planet Neptune in the Solar System (60 AU). Note that the brightness of the outer parts of the disc has been artificially brightened to reveal the faint structure.